The city of San Diego is expanding their plans and doubling the pace to bury neighborhood powerlines. The obtrusive powerlines and boxes will be relocated while closely following SDG&E’s circuitry. The new construction is being viewed differently throughout San Diego neighborhoods. Some agree that it boosts aesthetics while others wish to avoid road construction due to the city’s inability to keep up with their own schedule. Residents are also concerned about long-term utility boxes being stored during the duration of construction. A recent discovery by city officials, 25% more utility lines are needed to be buried than predicted. The rate of construction needs to rapidly increase to bury the remaining powerlines. Since 1970, the city has only buried approximately 428 miles. It is predicted that if the pace does not pick up, the 1,250 remaining miles will not be buried until the next century. This plan is expected to double in pace. James Nabong, the city’s new manager for the program mentions, “We are currently looking at ways to accumulate more work volume at a faster pace”. “The good news is the available revenue streaming in to fund the program will support a higher rate of undergrounding conversion. A “five-year implementation plan” will be included in the updated master plan and will give San Diego residents a more accurate estimate on when they could expect construction within their neighborhoods. The first year of the “five-year implementation plan” is planned to take place within the following neighborhoods: La Jolla, Pacific Beach, Midtown, Mission Hills, North Park, Bay Terraces, Chollas View, Skyline, Clairemont, Lake Murray, Serra Mesa, Logan Heights, Fairmont Village and Southcrest. 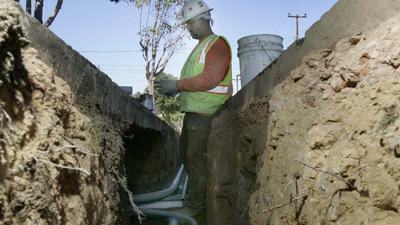 Check out the article from San Diego Union Tribune to read more about their new undergrounding plan.